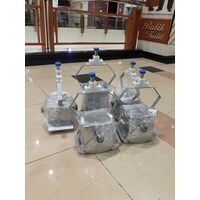 ALAT LABORATORIUMAlat ini dirancang untuk pengambilan air sumur bor yang diameternya sangat kecil dan cara kerja nya sangat simpel seperti pengambilan sumur bor rumahan , sumur bor industri , dan sumur bor perminyakan .Spesifikasibahan : stanlisdiameter : 5cmpanjang : 60cmtali : panjang 20metercara kerjaalat langsung dimasukan kedalam sumur untuk kedalaman tersebut sesuai yang dinginkan lalu mesenger dijatuhkan secara otomatis alat tersebut akan membuka sehingga air akan masuk setelah penuh alat akan menutup dengan sendirinya sehingga sample siap diangkat keatas permukaan . 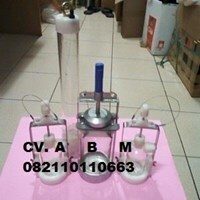 ALAT LABORATORIUM EKMAN BOTTOM DREDGE:Use for obtaining samples from river, stream, or lake bottoms. Works best in soft, silty, vegetation-free bottoms. Unique of sample chamber lid and jaw assembly release mechanism offers not only positive action when activated, but also helps to reduce instability and frontal shock wave effects when lowered rapidly. 6″ x 6″ x 6″ deep sample diameter. 316 stainless steel dredge construction, plus stainless steel springs and cables. Enclosed rip release mechanism. Use 11 oz. messenger. 10 lbs. Kit includes: grab, case, line and messenger. Extension handle replaces messenger in shallow water. Lake Partners’ Programme (MOE) Secchi Disc (water clarity/turbidity)The goal of the Lake Partner Program is to protect the quality of Ontario’s inland lakes by involving citizens in a volunteer-based water quality monitoring program. The Lake Partner Program is a province-wide, volunteer-based, water-quality monitoring program. Volunteers collect total phosphorus samples and make monthly water clarity observations on their lakes. This information will allow the early detection of changes in the nutrient status and/or the water clarity of the lake due to the impacts of shoreline development, climate change and other stresses.Volunteer involvement requires the collection of one water sample for total phosphorus in May for lakes on the Canadian Shield. These samples are returned postage paid to the Dorset Environmental Science Centre for analysis. 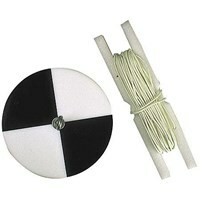 In addition, volunteers are asked to make a minimum of 6 (monthly) water clarity observations using a Secchi disk. These observations are mailed to Dorset at the end of the summer. 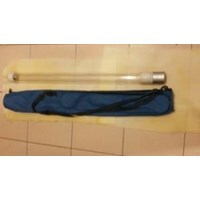 ALAT LABORATORIUMThe Van Veen grab is a lightweight sampler designed to take large samples in soft bottoms. Its long lever arms and the sharp cutting edges on the bottom of the scoops, enable it to cut deeply into the softer bottoms. 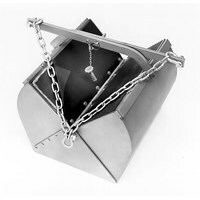 The Van Veen grab sampler is manufactured in two sizes from stainless steel. The weighted jaws, chain suspension, and doors and screens allow flow-through during lowering to the bottom and assure vertical descent where strong underwater currents exist. The relatively large surface area and the strong closing mechanism allow the jaws to excavate relatively undisturbed sediments. When the powering cable is slowly made taut, the chains attached at the top of the release exert great tension on the long arms extending beyond the jaws, causing them to lift, dip deeper into the sediment, and trap material as they tightly close. The stainless-steel, 583 micron, door screens have flexible rubber flaps which, during lowering, are lifted. When the grab settles on the bottom, the flaps fall back and cover the screens completely, preventing any loss of sediment during retrieval. Buat Permintaan Untuk "Laboratorium Kelautan"